Finally the moment has arrived when you have something more than a rumor round up on the second generation iPad. The announcement of iPad 2 is probably the second most awaited moment of the year for Apple fans, first one being the launch of iPhone 5. Want to grab the second-gen iPad ASAP? We’ll guide you through everything you need to know. You don’t want to want to get late, do you? 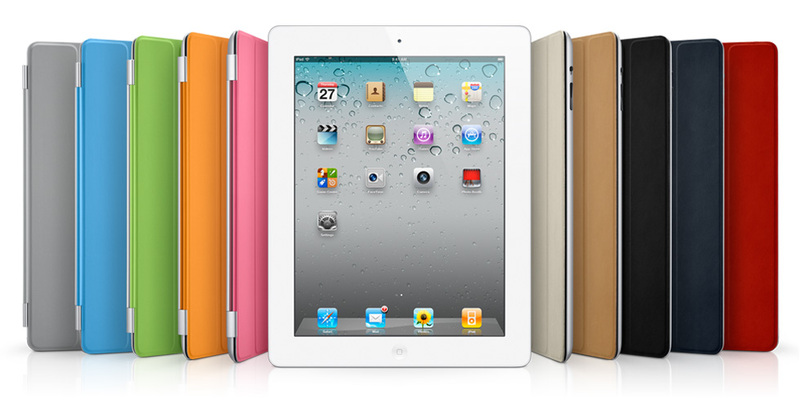 iPad 2 is expected to run out of stock soon after the launch. If you want to be one of the first ones to grab this magical device, pre-order is the way to go. The first iPad was announced in end of January, while the shipment began in April. 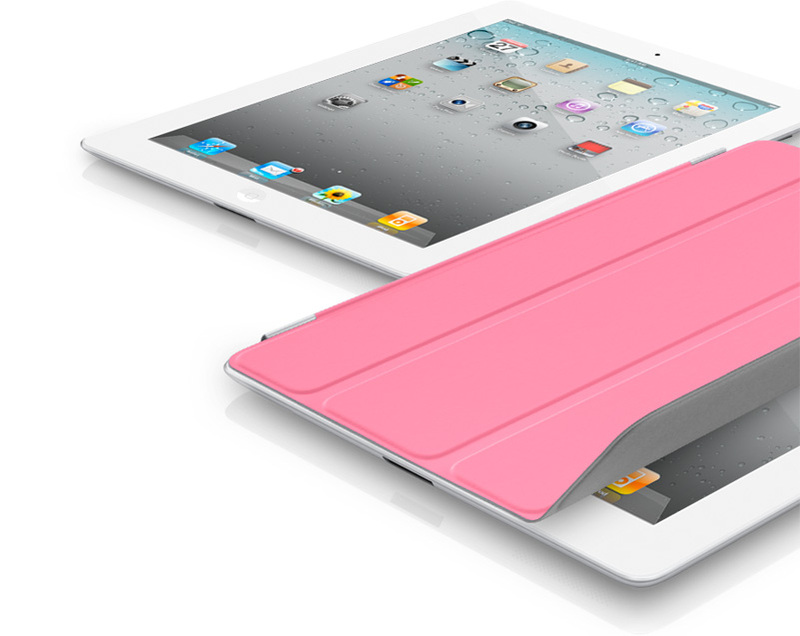 The pre-ordering for iPad 2 however starts real soon. How soon? 11th of March for the US and 25th for 26 other countries. Want to Get it Off Store? Speculations come true! That’s exactly how we thought the evolution of iPad is going to be and the Jobs announces dual core CPU. The CPU will be at-least 2x faster with the graphics as much as 9x. Like we reported earlier, the new-gen iPad is really really thin and lighter too. As jobs puts it, despite adding so much to the original iPad, it’s still 33 percent thinner. 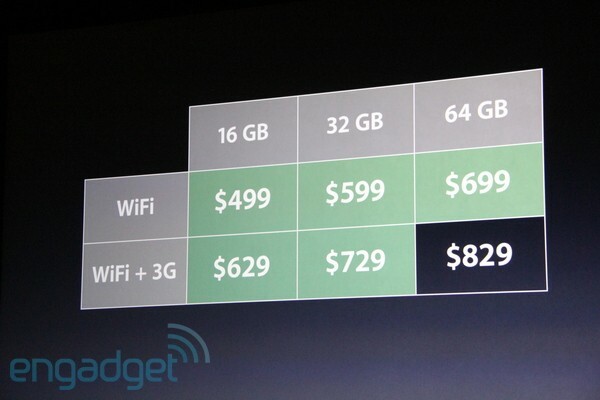 The width has went from 13.4mm to 8.8mm which makes it even thinner than the iPhone 4. Finally Apple has figured a way to make the product white without having to degrade the cam quality. With that Apple announces iPad 2 in white. Not only it’s announced, it will be available from the day one. Just because we highlighted the white one doesn’t mean the won’t offer it in black. Finally you can say good-bye to one-sided video calls as Apple officially introduces Facetime in iPad 2 with a front facing camera. Some people may argue that self-snapshots on a 10" tablet is plain weird but I think video calls on iPad will be so much more fun than iPhone. If you can do on TVs, why not on a tablet? Yup! There is a camera on the back too for shooting videos in 720p HD quality. With the built-in accelerometer, you can rotate iPad to portrait or landscape, or even upside down, and whatever you’re watching, reading, or seeing adjusts to fit the display. And now the accelerometer, three-axis gyroscope, and compass all work together. They sense which direction iPad is heading and how it’s moving. So games, maps, and other apps know your every twist, turn, tilt, and 360. It’s an epic win for gaming. And it’s just the beginning of better-than-ever iPad apps. iPad 2 will ship with the latest and greatest release of iOS to date, that is iOS 4.3, which will be available for download on March 11. Every iPad is built with advanced 802.11n wireless technology. It automatically finds Wi-Fi networks, which you can join with a few taps. iPad is also available with 3G connectivity on either AT&T or Verizon Wireless networks. So if you’re somewhere without Wi-Fi, such as outdoors on a camping trip or on the road, you can still surf the web, check email, or get directions. iPad is one big, beautiful display — 9.7 inches of high-resolution photos, movies, web pages, books, and more. LED backlighting makes everything you see remarkably crisp, vivid, and bright. Even in places with low light, like an airplane. And there’s no wrong way to hold iPad. It’s designed to show off everything in portrait and landscape, so with every turn (even upside down), the display adjusts to fit. Because it uses a display technology called IPS (in-plane switching), it has a wide, 178° viewing angle. Hold it up to someone across the room, or share it with someone sitting next to you, and everyone gets a brilliant view. Even with the new thinner and lighter design, iPad has the same amazing 10-hour battery life.1 That’s enough juice for one flight across the ocean, or one movie-watching all-nighter, or a week’s commute across town. The power-efficient A5 chip and iOS keep battery life from fading away, so you can get carried away. What do you get along? well, not a lot of stuff but these two handy accessories. 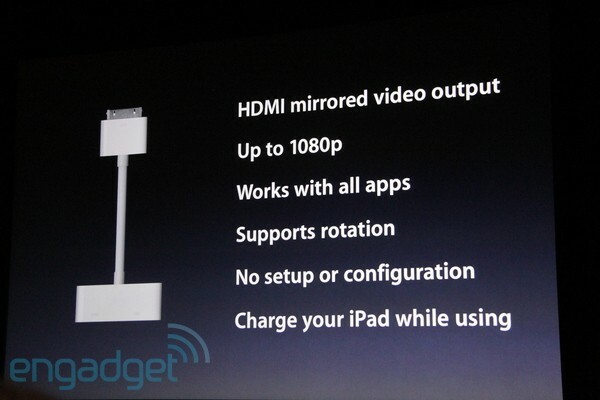 Just for $39, you can now have HDMI on you iPad 2 which supports output upto 1080p. All you need is a cable. The real innovative part? It even charges your device while the cable is plugged. and that’s all we have from iPad 2.